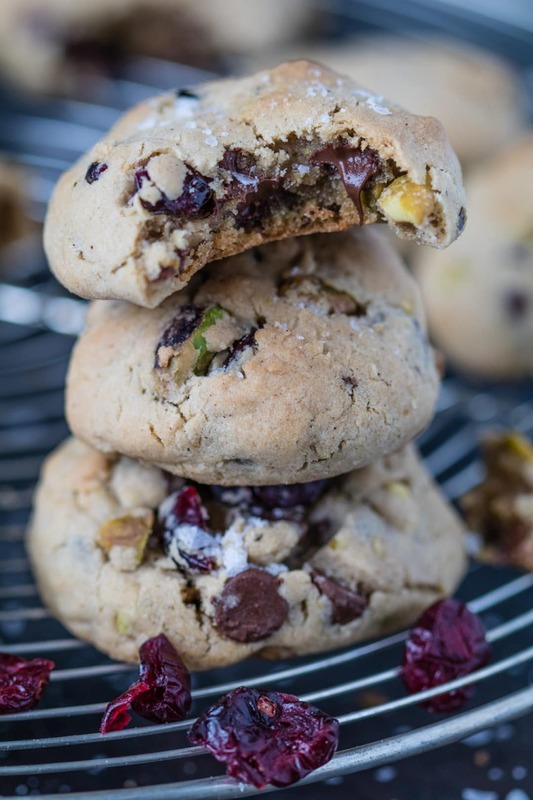 I think you’ve found a winner with these pistachio cranberry cookies! These pistachio cranberry cookies will literally melt in your mouth & make the whole family happy! Christmas came early for me this year!!! Well…I actually spoiled myself. I bought the NEW MacBook Pro with the touch bar. I could not resist! I am using it right now!!! 🙂 I haven’t had a new laptop since 2009, so I figured it’s time. I had to justify the purchase somehow 😉 Plus…it’ll help with blogging and editing photos! How is Thanksgiving already 1 week away? Literally time is zooming by. People tell me, “Just wait until you have kids, it goes by even faster…” ahhhhh good thing I am no where near that yet! haha. So, the past couple of years my mom has slowly started letting me take the reigns for cooking the Thanksgiving feast. I now truly appreciate and give mad props to my mom for doing this for our family and friends every year! It is serious work to get everything done!! And on top of that everyone wants their “favorite green bean casserole” or the specific potatoes…and I feel like I end up with 3 different mashed potatoes and 5 different stuffings to please everybody! Who can relate to this madness?! By the time we sit to eat with everything on the table, I need a blanket and a pillow! Now don’t be a tough cookie and go get to makin’ this recipe! Christmas Cookies...Thanksgiving Cookies...whenever you want a cookie cookie...you decide! Either way, they are chewy and soft! Preheat oven to 375 F. Grease 2 cookie sheets and set aside. Or use a silpat. Using a stand or hand mixer, mix softened butter and sugar(s) for ~2 minutes, or until mixed together well. Then mix in the egg and vanilla. In a medium bowl, combine the next 5 ingredients. Pour the butter/sugar mixture into the dry ingredients and mix well. Then fold in the remaining 3 ingredients. Note: the mixture may seem crumbly, but once you form them into cookies and press the dough together it is fine! Roll cookies into the size you want (I do about 2 Tbsp.) and place on the greased cookie sheets. Bake for 12-15 minutes. Enjoy! 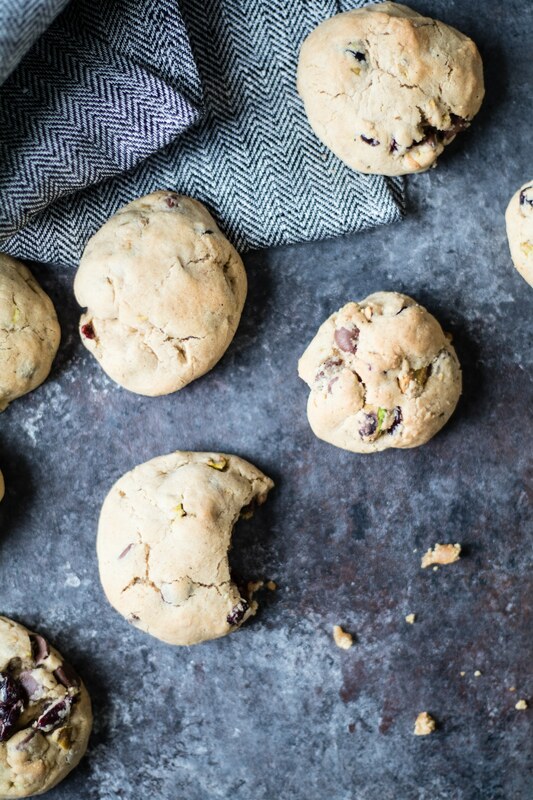 PIN these Pistachio Cranberry Cookies for later! Pistachios in cookies are my favorite! Plus love the green and red together for Christmas! I need these in my life right now! You’ll love them! 🙂 Thank you – have a great weekend! The pistachios and cranberries make this perfect for Christmas! Extra festive! The sweet and salty combo is so good! Thank you! 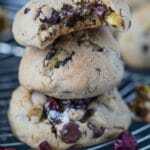 I’ve made so many cookies but these are truly different and look amazing! I cannot wait to try how chewy they are! I can’t get enough cookies lately! Thank you! Doesn’t. Get. Better. Nice to have a different chocolate chip cookie recipe around! The pistachios paired so well with the cranberry!! So good! Such a fun flavor combo huh!? Thank you!